Kaye Fox (right) with her spouse and care partner, Lisa. Ah, it’s that most wonderful time of the year. The store shelves are groaning gentle reader, from the weight of merchandise placed on those shelves and the skinny arms which hold them up. Stores are crowded with more racks of clothing and the people, ah yes the people, loaded down with stuff over-flowing from their carts, picking out things for those who are naughty and nice. After all it is the season for forgiveness. The makeup counter is bustling with people sampling items and browsing free gift offerings. There are numbers of sales people trying their best to get you to sample all of the pretty things they have for you to buy with the offer of a free gift! People crowd around shoving and pushing trying to see the merchandise. The music overhead blares “Deck the Halls” and trees, wreaths and even a Santa or two are decked out with bright blinking lights. And the noise gentle reader, it is deafening to a point where it’s difficult to understand the words the carolers are singing as they joyfully ring their bells. Ding, Dong, Ding, Dong. I tell you all of this, gentle reader because that woman is me! I am one of over 5 million individuals in the U.S. affected by this terrible disease. 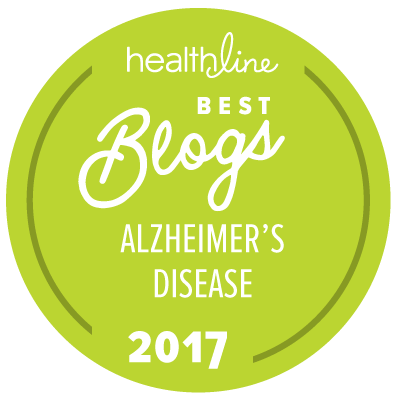 When you have Alzheimer’s, or another dementia, your life can feel like a mess during the holidays. The loud noises, the ringing bells, the singing, twinkling lights and the crowds can make a person with Alzheimer’s feel all sorts of horrible, scary feelings. This stimulation has caused me to feel panic stricken, unable to move at times. You see with dementia, things are always changing. I have good days that can last for weeks and then suddenly, I find myself in a life-squeezing terror because my partner dropped a dish and the noise triggers a panic. I freeze not knowing what to do. My heart seems as if it is going to burst out of my chest. And then it’s over. A degree of peace washes over me like water in a shower and everything is right again, but maybe only for a moment. A child’s scream, a baby crying — those are triggers for me. I go into a stomach-griping fear, and it rises up and makes me want to scream. Assist the individual with dementia to set their own limits early, and be clear about them with others. Remind them that they don’t have to live up to the expectations of friends or relatives to attend holiday gatherings or participate in every social event. Encourage family and friends to visit the person with dementia — even if it is difficult for them. However the number of people visiting at one time should be kept to a minimum. Perhaps try a few people visiting quietly in a separate room. Ensure that the person with dementia has adequate private time to rest between visits or as needed. Be mindful of sensory stimulation such as light intensity or sound. Avoid changing light intensity; too bright or too dark. Be careful not to make sudden, loud noises that may startle the person with dementia or cause overstimulation. If you are a caregiver and receive an invitation to a holiday celebration which the person with dementia cannot attend, GO YOURSELF. Enjoy the chance to be with friends and family who love you and enjoy your company. Ask friends and family to visit with the person with dementia while you are away. For more information about how you can support the Alzheimer’s Association to enhance care and support for those affected by Alzheimer’s disease, visit www.alz.org or call their 24/7 Helpline at 800.272.3900. Join me and let’s make a difference together. Kaye Fox is a member of the 2012 Alzheimer’s Association National Early-Stage Advisory Group. As an advisor, Kaye is interested in advocating for support groups that concentrate on living with the disease and planning for the future. More specifically, as a transsexual woman and pastor, Kaye has a special interest in developing “safe” meetings for members of the LGBTQ community dealing with Alzheimer’s disease. Min. the Holiday events wit plenty of time for her to recover. Rest is so important along with being in familier places. Thank you for sharing your story. Merry Christmas. Thank you so much for the great tips. I know that changes in the environment can really have adverse reactions on some with Alzheimer’s Disease and dementia as my Mother has this horrible disease. I have noticed this week that she has seemed more nervous than usual. I did not think about it being from the holidays and all of the company that has been coming by. Reading your tips was very helpful. Hope you have a very Merry Christmas. Joe. Thank you Joe. you are right on in your discovery of the fundamental truth. change is difficult for Alz. patients to handle. Many people dont realize how it affects the loved one when family thinks they are doing the right thing by immersing them in Christmas, because they think that will cheer the loved one up, when really it it sheer toruture, and in the case of my father you could also see his embarassement of not remmering names, not hearing well, poor eyesight, all he wanted to do is stay home . As I told my mom, you wont be able to celebrate like you used too for quite sometime, but celebrate it like your first Christmas together, sitting, quietly holding hands and watching the snow fall by the light of the chirstmas tree. Just the two of you, together in the love that is Christmas. Im sure that Dad really enjoyed that. We celebrated his life a year ago December. Thank you for sharing an important point. Christmas and other holidays can be so overwhelming. Quite times are so important to the patient . to recover and recharge for another event. If he/she is becoming more and more agitated the is nothing wrong leaving early. Thank you Kim for your comments and questions. First I would talk with your husband and tell him what is going on and if he has noticed anything different going on with you. Then secondly, I would talk to my dr. There are some simple tests she can give and possible suggestions and even a referr and tests for further evaluations. That's what I tell most people. My dr. in my case, suspected something in a regular exam. BTW, just to write this caused me to look up ten words in the answer or substitute other words for those I can spell. I pray that the Lord will strengthen and guide you and husbands path. Early detection is of great value and wil remove all of the confusion that you are going through now. Remember it also may be something else as well. It is my understanding that ALZ can be hereditary but not always. I had cancer 8 years ago and a a breathing program which I almost died from. YOu and you husband are in my prayers. Please keep me posted Kim. God Bless you both and Happy Holidays! I remember the last Christmas Dinner I had bringing my Mom to my house for the holidays. With grandkids running around; lots of conversations going at the same time we sat down to lunch. Mom just sat at the table and cried. She kept asking me to take her home that her Moma needed her. She kept trying to convince me that her "Moma was sick". I am a geriatric nurse who deals with Alz. patients everyday all day long. But the realization that the noise and the change of scenery (brought her to my house from the nursing home) was too much for her. She ate very little due to crying. I took her back to NH immed. Great tips!! People with Alzheimer’s and dementia do have adverse reactions when they see something new in the envirnoment. They are particularly very nervous. Is there a test which can tell us whether Alzheimer’s in heriditary? ?